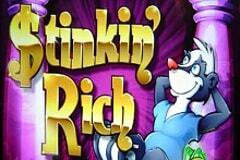 It’s nice to see a pokie where a little thought has gone into the title, and in the case of Stinkin’ Rich, from IGT, the name defines what the game is all about. The reels are filled with images of rich people, side by side with rotting fish, garlic and smelly old trainers, and there’s even a couple of skunks and a Trash for Cash feature to help bring in some extra wins. The symbols are all arranged over 5 reels, but where most pokies have 3 or maybe 4 symbols on each, there’s 5 per reel here, which is largely down to having 100 paylines running across them. Any less, and it would become too easy to complete winning combinations, and IGT want to keep a little of the wealth spent on this game for themselves. It’s possible to play Stinkin’ Rich for a wager of just 0.01, but anyone opting for this will be sitting around for a while, as 99 out of the 100 lines won’t be active, and although it’s still possible to trigger bonuses this way, to qualify for all potential wins the minimum stake is 1.00 per spin. This can be adjusted upwards to a maximum of 300.00 and in the normal run of play, wins come from landing 3, 4 or 5 matching symbols across a line running on sequential reels from the left side. This is an older pokie and the cartoon style to the symbols only serves to emphasise this fact, but it still looks pretty good, with lots of colourful characters turning up after each spin. The reels are surrounded by a purple border and there’s piles of shiny gold coins underneath them. All symbols are themed, and we see the various smelly objects creating the smaller, but more frequent wining lines. Foul footwear, fetid fish and choke-causing cheese are each worth 10x, 50x and 250x the line bet when they land on 3, 4 or 5 reels at a time, while some ghastly garlic and an effluent-like egg pay out 15x, 100x or 300x. On the rich side of this game, we see a number of loaded characters such as the young tycoon and lady in a fur coat, each of whom pays 30x, 250x or 500x the line bet, and the top-value toff is a lady in a green dress who will hand out 50x, 500x or the jackpot of 10,000x the line bet when she graces 3, 4 or 5 reels. A couple of happy-looking skunks are there to liven things up, with the little stinker in a yellow shirt acting as a wild, replacing any standard symbol if she can then complete a winning line. She won’t be able to act as the blue-shirted skunk however, as he is a scatter symbol who can stop in any 3, 4 or 5 positions to reward players with 3x, 20x or 100x the total triggering bet, not just the per line stake. If the Trash For Cash symbol stops on reels 3, 4 and 5 at the same time, a quick bonus round starts, where players click on 1 of 3 tiles to reveal a multiplier amount. The values on the other 2 tiles are then revealed and combined with the multiplier for a win of up to40x the stake. The Key To Riches free spins game starts when the triggering symbol turns up at least 3 times on an active line. Although only 5 spins are awarded, if more than 1 line triggered the round, the number of extra games is multiplied, and however many are played, there’s richer symbols on the reels throughout them. It’s possible to retrigger the free games over and over, to a potential, if unlikely, maximum of 325 games. This is a fun pokie that has a fairly unusual theme. The idea of mixing images of wealth with images of decay sounds like it could be a commentary on the times, but really it’s just a play on words that helped IGT release a game with a funny title. Although everything is in a simple cartoon style, it still looks good and all of the symbols have been drawn by someone with a sense of humour, with the lower value items and the skunks being particular highlights. But it could all look classy and still be rubbish if the features were no good, so fortunately we have a pokie where the wilds, scatters and in-game bonuses are all potentially very rewarding. The only downside is the relative lack of free spins, although most players should trigger more than just the basic 5, and as the reels are richer, they could end the round stinkin’ rich themselves.